Perkfection will help your sick plants recover from and prevent diseases. Perkfection is a new product for the home gardener and is one which will help your sick plant problems. 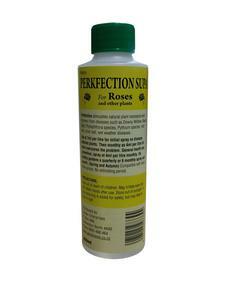 Perkfection helps roses and other plants recover from and prevent diseases. Perkfection assists the plant to overcome disease problems naturally. Try it on your roses, fruit trees, fruiting vines and bushes. Even if they are health they will produce better and likely not to require other fungus controls.